Travelwheels Brisbane Campervan Hire deals! We specialise in good value for money Brisbane Campervan Hire and our office is only 8kms away from Brisbane Airport. Travelwheels Brisbane Campervan Hire have 5 different campervans for hire to suit all budgets. 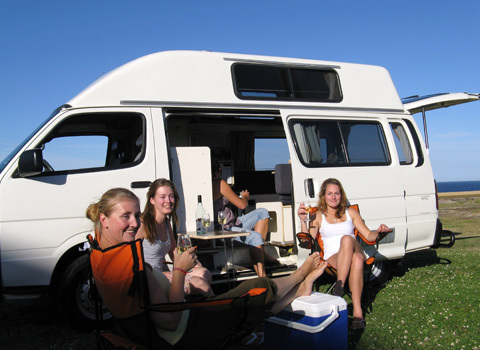 We can hire to groups of up to 5 people and have campervans suitable for families. Travelwheels Brisbane Campervan Hire also offer automatic campervan hire which is very popular with our Australian customers. Travelwheels Brisbane campervan hire office is only 8kms away from Brisbane Airport. This makes it easy to fly in to Brisbane and grab one of our Brisbane campervan hire specials. Travelwheels campervans is close to the airport, and this means you can get on the road as fast as possible! You could literally be starting your holiday within an hour of picking up your bags! No need to go in to city centre and fight the traffic! Fly in and pick up your Travelwheels Brisbane Campervan hire vehicle and hit the road and start exploring Queensland. Check out Travelwheels Brisbane Campervan Hire special offers online. Remember we will price match all our competitors prices for Brisbane campervan hire. Below are the details of Travelwheels Brisbane campervans office. We are located at 20 Noble Avenue, Northgate, Brisbane. Below is a list of some free things to do in the Brisbane area with your Travelwheels Brisbane Campervan Hire van. NOTE – We recommend staying at one of the campsites out of town. Alternatively some of the hostels also have camper parking places which will allow you to park up your vehicle and take the bus in to town. Then it’s easier to use public transport to view the sights of Brisbane city centre. 1. FREE CITY BUS SERVICE – Do the Loop which is a free bus service that circles Central Business District. It stops at several destinations including Central Station, Queen Street Mall, City Botanic Gardens, Riverside Centre, QUT and King George Square. This way you can get a free tour of the city before you explore the rest of brisbane in your campervan. 2. SOUTHBANK BEACH – we recommends visitings Australia’s only artificial inland city beach with 4000 cubic metres of sand for you to play in! Great space for families and a safe environment for kids to play in. 3. GUIDED WALKS IN ROMA STREET PARKLANDS – Take a free guided walk through this peaceful garden precinct and discover history, plants and public art. Tours take about one hour at a leisurely pace. 10am and 2pm daily. To book call (07) 3006 4545 during business hours. 4. QUEENSLAND POLICE MUSEUM – Learn how the police solve crimes at the Queensland Police Museum at police headquarters at 200 Roma Street. Open Monday to Friday, 9am-4pm. Phone: 07 3364 6464. 9. EXPLORE CITY’FREE PARKS – The city has 1,500 parks and public gardens making it an easy city to find a shady place to sit and watch the world go by. Find a quiet spot in the City Botanic Gardens at Riverside or wander along one of the best urban walks in Australia the Energex Arbour, a one-kilometre path that winds its way through South Bank Parklands. 10. DAISY HILL KOALA CENTRE – 25km south-east of the city centre, and part of a greater region known as the koala coast, Daisy Hill Koala Centre is situated in the open eucalypt forest at Daisy Hill Forest Reserve and is a bushland retreat for koalas and other native animals. It is open every day from 10am until 4pm. For more information about Brisbane Campervan Hire with travelwheels campervans, why not send us an email? We have plenty of free advice on great things to do in the area, and some useful free trip planners for the Brisbane area. F eel free to contact us and you can write in English, Deutsch or Français.